Season passes can be tricky things. Should a developer play it safe, or go out on a limb? Should they make tightly woven episodes, or stretch things out? Do they spoon feed you, or make you sing for your supper? Also, ignoring storylines and side quests, can I maybe get some new weapons and armor to freshen things up? Good news: the Assassin’s Creed Origins Season Pass does a bit of everything. But let’s give that statement a little perspective: the core content, even without the season pass, makes for a big game. It took me somewhere in the neighborhood of 80 hours to finish the core game—before I even cracked open the season pass. Did I say the game is big? I meant enormous. As an appetizer in the season pass, they first hand you a Roman Centurion Pack. It turns Bayek into a lion pelt-wearing soldier of Rome. I personally can’t wear it because I can’t condone what Rome stands for in this game. They’re the enemy, and I’m not much of a “wear the skin of my enemies” kind of guy. Regardless, the Roman Stallion mount was my early favorite. Great-looking horse. Moves at a fierce clip, even if I can’t detect much of a performance-based difference between the game's 200-drachmas mounts and its 5,000-drachmas mounts. I forced myself to use the long, straight, legendary swords of the Roman Centurion Pack, even if I prefer a blade with more of a curve to it. The second pack is the Horus Pack. This is more my style, since I like to keep Bayek dressed and armed in all-Egyptian-everything. Bloody arm wraps, feathers on his shoulders, and an epic falcon helm. Two legendary bows round out this airy and arid set of armor. I dislike the hollowed-out sound of Bayek’s voice when he wears the helmet in a cutscene. I also dislike how—for the Roman Centurion armor, too—Bayek’s upgraded gear goes away for static chest armor and static forearm guards, etc. As good as they look, there’s no substitution for the amount of work you’ve put into your upgradeable kit. Also, I like the camel that comes in the Horus Pack. Camels move slow and sloppy compared to horses, but how many video games let me ride a camel? Well, all right then. Give me the Horus camel. The brunt of the season pass comes in DLC 1, The Hidden Ones; and DLC 2, The Curse of the Pharaohs. The Hidden Ones takes place several years after the conclusion of Origins. You need to be at the level 40 cap, or very close to it, before you take on DLC 1. If you’re not, then you’re going to run into a lot of enemies with red shields above their heads (meaning you’re in for a world of hurt) or even skull shields above their heads (forget it). But, provided you’ve finished everything you feel obligated to finish in vanilla Origins, and your level is at or near 40, you’re ready for The Hidden Ones. You receive a summons from an ally on the Sinai Peninsula, just across a skinny bit of water called the Gulf of Suez. The Hidden Ones are having a particularly rough time with the embedded Romans there. One loading screen later and you’re in the Sinai. 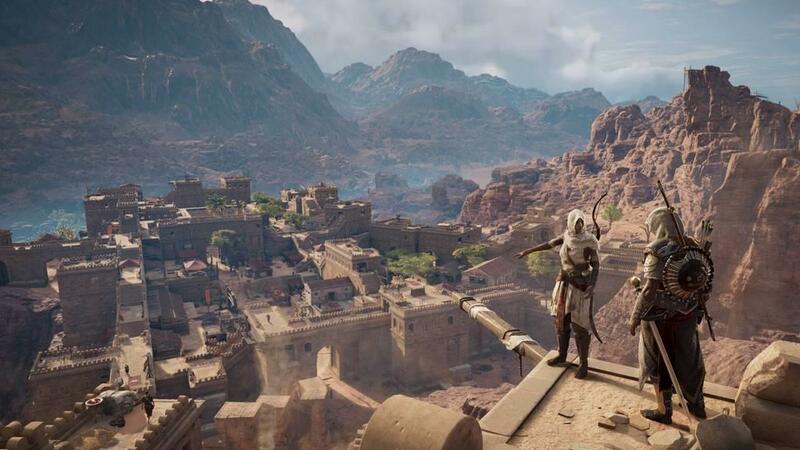 A massive rock quarry is Bayek’s point of entry. You’re on an entirely new chunk of map. The quarry’s ancient Minecraft-ian architecture turns the geography into something of a puzzle. Finding your way from point A to point B requires a lot more vertical ascension and descension than your typical visit to other Egyptian locations. Basically, it turns Assassin’s Creed Origins back into a parkour simulator. Often, in more densely built urban areas—like nearly every other Assassin’s Creed—you get to spend more time on rooftops than on horseback. That’s proven to be the opposite in regular Origins, but not to terrible effect. While it’s visually dull to climb rock faces compared to building facades, this is a reminder of just how good an Assassins climbing skills are. Think of other games that feature lots of climbing. Uncharted? The Shadow of the Colossus remake on PS4? They all made me wish I could climb like Assassin’s Creed, rather than whatever scaling ability those other games have. And trust me, I love both of those other games. The Hidden Ones’ missions are densely packed, introducing three high-profile targets from the start. Each bad guy’s profile sits next to the other in the Sinai Bureau's library shelves. You know the drill. Time to take out some proto-Templars. We’re also introduced to one of the core tenets of the Brotherhood: the Leap of Faith. Or rather, Bayek introduces the Leap of Faith to a new recruit. 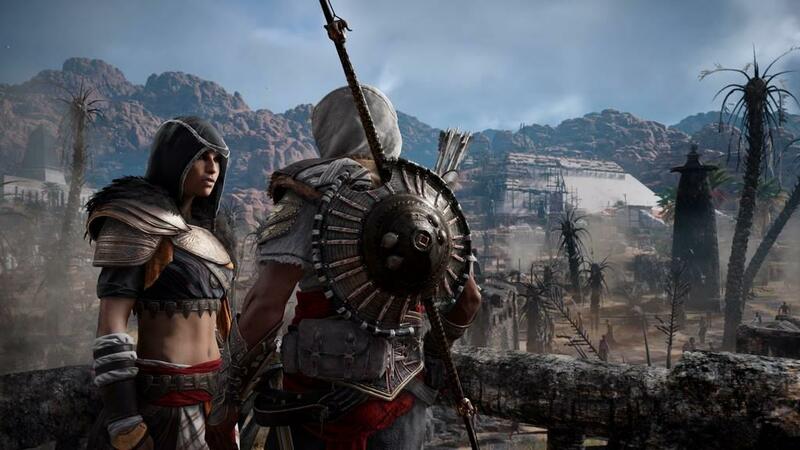 After proving themselves worthy to join the Brotherhood’s cause, Bayek leads the way as the recruit leaps from a rocky spire down into a telltale pile of hay below. It’s a heartwarming moment, for some reason. 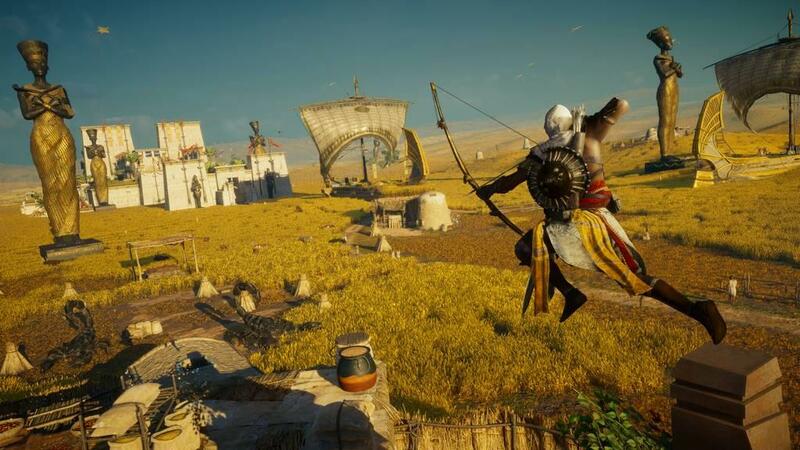 But especially when Bayek returns to the same jump later to find the same recruit practicing their Leap of Faith, over and over, for the pure joy of it. I wished there were more moments like these to be had in the DLC. 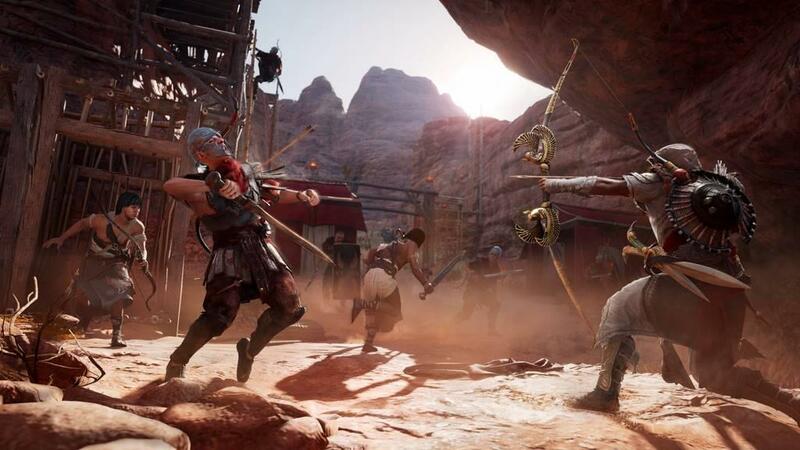 Since The Hidden Ones is meant for high-level characters, Bayek is dealing with consistently high-intensity situations. The guards all seemingly pack smoke and shields. The fortresses take up entire zip codes. I spend a good five or 10 minutes now with Senu in the air, marking targets and identifying auxiliary objects, and getting a feel for the land. That doesn’t sound like much, but it’s much more than I relied on Senu before. And I don’t know if The Hidden Ones changes the algorithm for how fire works, but I’ve died in more hyperactive (and sometimes glitchy) fires than ever before. Fires have been set off when I’ve used my sleeping darts on people. Fires have gone up when I’ve checked treasure chests. And fire doesn’t care if you’re level 4 or level 40, you'll die in seconds if a jug of oil is nearby. There are other minor bugs along the way that I hadn’t seen crop up in my previous 80 hours of Origins. Dialogue triggering improperly. Unsheathing my sword when I collect treasure. Loot you can’t loot. Scrolls you can’t read. Arrows you can’t grab. Nothing that a fresh reload couldn't fix; but reloading in order to fix basic gameplay mechanics like looting and reading isn’t ideal. I even had a gamebreaker show up when I had to slide some block off of an elevator, but the sliding block wouldn’t budge. I reloaded and the sliding block then moved just fine. Oh, I even had soldiers regaining health if my weapon happened to hit a wall after I’d hit them. Weird. That's not to mention three or four inexplicable crashes. Nothing complicated was going on. The DLC just crashes sometimes. This is true for The Curse of the Pharaohs, too; not just The Hidden Ones. The Curse of the Pharaohs begins with a parcel for someone down in Thebes, near the Valley of Kings. I hop on a fast barge for Egypt’s old capital. As soon as we hit the docks, an undead Queen Nefertiti wielding dual blades starts chopping up folks in the town square. I can’t kill her fast enough. She disappears in a wisp of ash. She’ll be back, though. Her and several other ancient Egyptian rulers are back with a vengeance. 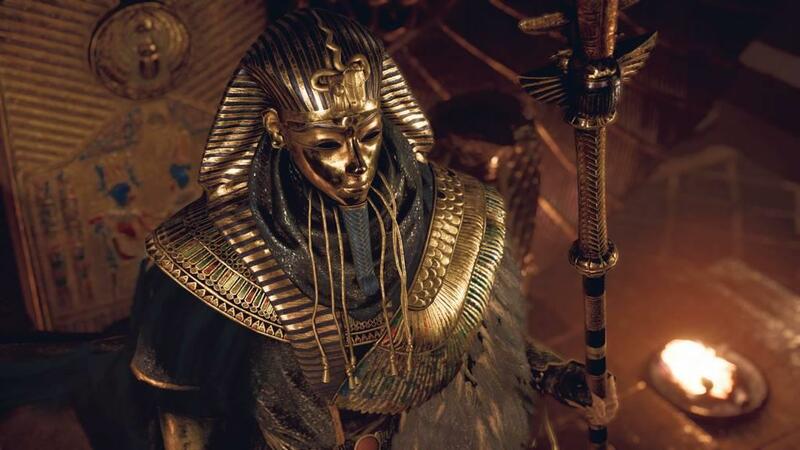 Someone took an artifact that didn’t belong to them, and if you’ve ever watched a movie about ancient Egyptian artifacts, then you know it's a no-no to take them from their resting places. Thebes is a town that isn’t afraid to take advantage of someone fresh off the boat—even if I am the highest-ranking Hidden One from here to the Sinai Peninsula. The Hidden Ones DLC takes you from level 40 to 45 at an alarming rate. The Curse of the Pharaohs takes you from 45 to 55 at a more measured pace, but the experience points still flow like milk and honey. As with DLC 1, do not start DLC 2 until you’re ready. Be at or close to level 45. There are few things more discouraging in Assassin’s Creed than running into a bunch of unkillable enemies. Much of Origins’ side quests were about exposing bad people using the gods’ names in vain. Tricksters, charlatans, etc., were all out to make a quick buck off someone’s misunderstanding of how the gods work. Not to say that Bayek is an atheist; far from it. But he can smell a scam from a mile away. The Curse of the Pharaohs, however, doesn’t deal in tricksters and charlatans. Everything you hear about the gods in this DLC is true. Nobody has to invent ghost stories when the ghosts are appearing in broad daylight to gut your friends and neighbors. The Curse of the Pharaohs starts using atmospheric touches to get your pulse up. Like the slow, dull thud of a heartbeat heard in my ears as I reach deeper into the tomb of Nefertiti. Or thin whispers in the wind start appearing that were never there in earlier content. In the original campaign, I’d wondered why there wasn’t more paranormal activity going on. Well, that’s because they were saving it for this DLC. It doesn’t turn Egypt into a haunted house. But it finally dips its toes further into just how inherently creepy tomb raiding can be. Also, you get to visit mysterious realms in this DLC. It takes Assassin’s Creed’s adherence to the historical record and turns it upside down. For Origins, which builds upon an enormous history and an even more enormous mythology, this is the part where developer Ubisoft gets to flex its creative muscle. In this mysterious realm—I’m not certain calling it the afterlife is wholly accurate, but it's as close as I can get—everything is 10 or 100 times what you’ve experience up to this point. Statues? There’s more of them than ever, and they’re bigger than before. Temples? Same deal. More, bigger. Enemies: more, bigger. And Bayek is dropped right in the middle of the Egyptian pantheon’s playground, figuratively shrinking him back down to the mortal he is. Egypt’s afterlife is populated with an almost comedic level of riches. People just stumbling over incomparable wealth. Even as I ransacked eternity for all its worth, that same Egyptian hospitality I’ve come to know and love shined through. As I swam in long, straight waterways of clear, sparkling water, a boatman would still always come along in order to give me a lift out of the river. Such a generous people. Yet it’s a land bereft of reinforcements, lacking in wandering patrols (for the most part), and absent much of the other drop-in drop-out wildlife that seems to poke its head into every other fight in Origins’ normal Egypt. 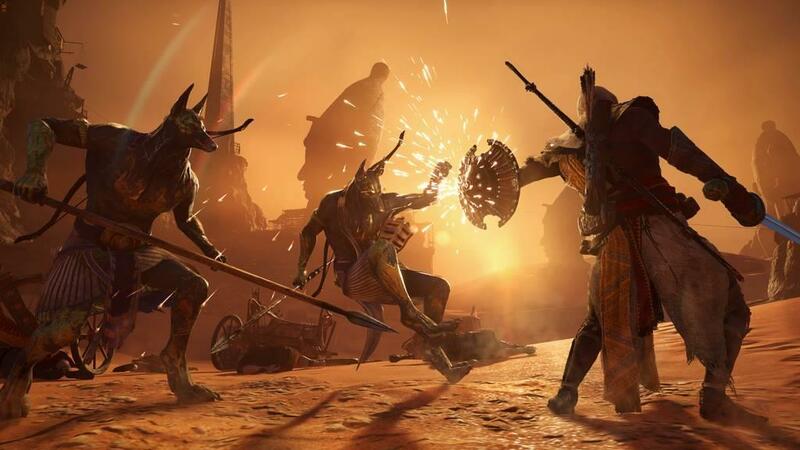 Curse of the Pharaohs feels like Assassin’s Creed Origins at its gamiest. Never before had I moved so determinedly from objective to objective. I took in my surroundings, but the wow factor wore off quicker than I would’ve liked. That happened because the settings became so obviously game-like in their construction. I advanced with a one-note efficiency in my kills, because there was little reason to be creative. I kept getting a too-much-of-a-good-thing feeling in the environments. This is probably the first time I just grew genuinely bored with Origins. The enormous temples to traverse, the hyper-symmetrical architecture, the endlessly rich decor, or, on the other end of the spectrum, the endless sandstorms or infinite lines of massive statues—it all grew monotonous. Every temple and palace was an even more luxurious example than the one that came before. Everything is made to make Bayek feel smaller. Oh, the dreamscapes are pretty. Let me be clear. But each playground in eternity is turned into a gimmick. Each location in the afterlife is overdone to the point that it feels like a parody of itself. I took some cool pictures. I did. But it no longer felt like I could capture something unique in the pictures I took. If you’ve seen one 400-foot bust of Ramses, you’ve seen them all. The Assassin’s Creed Origins Season Pass is good stuff, though. The inexplicable appearance of ancient Egyptian kings is fine, but the inexplicable appearance of numerous bugs isn’t. The season pass does one thing you’re hoping for and one thing you’re afraid of: It just depends on your needs as to which is which. DLC 1 is meat-and-potatoes Origins gameplay and narrative (if that's what you're afraid of), while DLC 2 goes out on a limb without relying on sci-fi antics to get weird (if that's what you happen to be afraid of). Coupled with some effective and effectively cool arms and armor, this is a solid season for Bayek of Siwa.